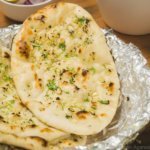 Naan is an oven baked flatbread. It becomes garlic naan, when the dough has garlic in it. 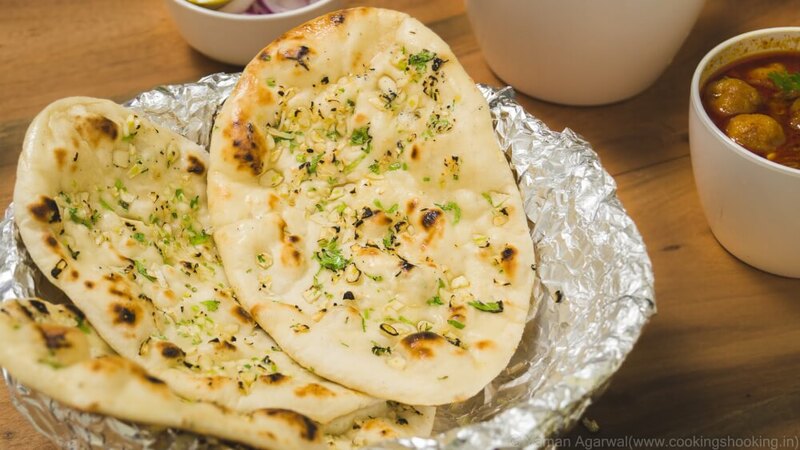 Naan is baked in Tandoor, which is a clay oven, which is eaten majorly in the northern parts of India and in cuisines of central, south, and west Asia. The word, nan for flatbread originated from Iran, however, the spelling changed from nan to Naan in 1979 and since then, it has been spelled as naan. Tandoor is the traditional equipment of baking it. In olden times, the oven was built underground. Origin of Naan goes back to 1300 AD in the notes of Amir Khusrau, the Indo-Persian poet. Naan was cooked in the Imperial Courts of Delhi and during the Mughal period, it was accompanied by keema and kebabs. Sprinkle some flour on a flat surface and knead the dough further till it is soft and not sticking to fingers. Cover the dough in a bowl with cling film and let it rest for an hour or until it doubles the size. Now, knead the dough again and make four to six balls from the dough. Roll each ball in a round or oval shape on a floured surface. Take a small bowl and put butter and chopped garlic. Mix it well. Take the naan and put it on the grill. Turn it over with the help of a teaspoon and add a tablespoon of garlic and butter on the top side and spread it evenly on the surface. Press the garlic with a spoon to make sure that garlic is pressed well inside the naan. The naan would be ready in two minutes. Do the same for rest of the naans.